What’s the deal? This is the third Los Angeles Historic-Cultural Monument in a row about which I can only speak in the past tense. Not only that, pictures of it are few and far between. When Patricia Connolly died in 1887, the 160 Southern California acres she had called home since 1868 went to her son (or possibly her brother, depending on which source you cater to), Joseph Patrick Connolly. 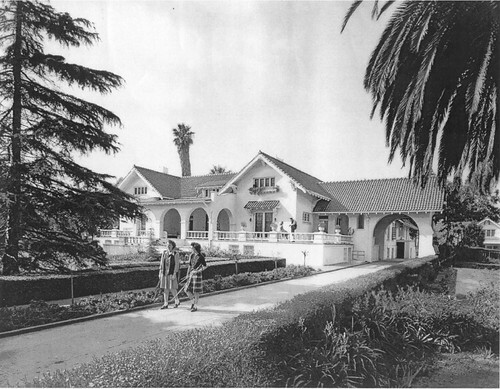 It was he who, in 1912, hired the founding president of the Southern California chapter of the American Institute of Architects, Octavius Morgan, to build this eighteen-room, 14,850-square-foot, Mission Revival mansion for a cost of $75,000 (we’ll see lots more of the architect’s works throughout the list of HCMs as part of Morgan, Walls, and Clements). 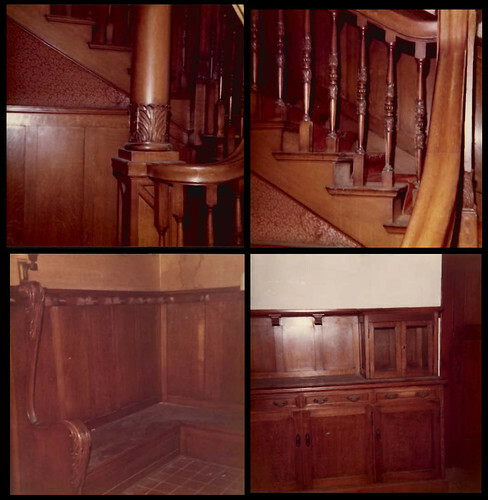 There were tennis courts outside, a bowling alley in the basement, and billiard and snooker tables upstairs. 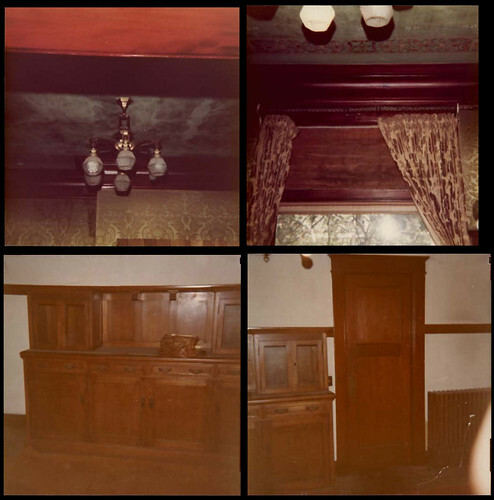 The home was noted for its rich mahogany paneling, gorgeous tile work, crystal chandeliers, grand fireplaces, and stained-glass windows. Connolly also kept a lake at what is now Normandie between 78th and 83rd Streets stocked with ducks and fish. Joseph P. Connolly died in 1929, leaving the estate to his son and daughter, who began selling off chunks here and there. 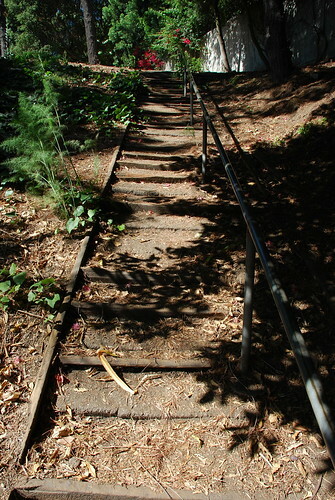 By 1937, the estate had been whittled down to just thirty-five acres. This is when George Pepperdine, having made his money as the founder of the Western Auto Supply Company back in the oughts, bought the property for $150,000 to begin the Christian college that would become Pepperdine University. Undergoing only relatively minor changes (i.e. one bedroom and French doors in the breakfast room), the former Connolly home was used as the university’s administration building, then for holding classes, community and social events, and housing for both chancellors and students. Pepperdine University broke ground on its Malibu campus in 1971, and by the end of the 1976 school year, most regular classes and departments had been moved to the new location. After some interest to turn the property into low- and mid-income housing didn’t materialize, the Crenshaw Christian Center, run by the Rev. Frederick K.C. Price, bought the old campus, now thirty-two acres, in 1981 for a cool $14 million. By this time, Pepperdine had been using the Vermont Knolls campus as the administrative headquarters of the schools of education and business management. Having failed to buy a 23-acre plot from the Inglewood Unified School District the year before, the church immediately announced plans to build on its new property a 10,000-seat sanctuary to house its extremely large congregation. The problem was, the President’s House – the old Connolly residence – was in the way. 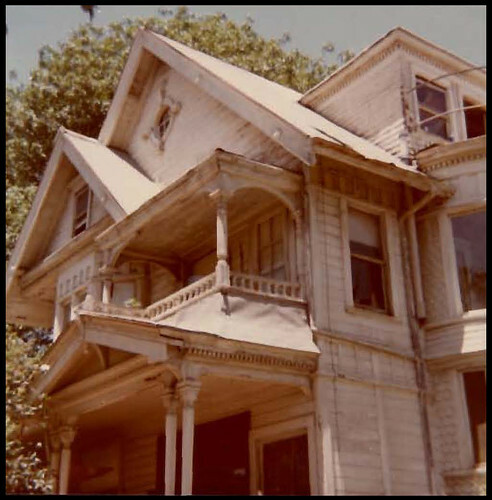 The church applied for a permit to raze the seventy-year-old mansion in the summer of 1982. 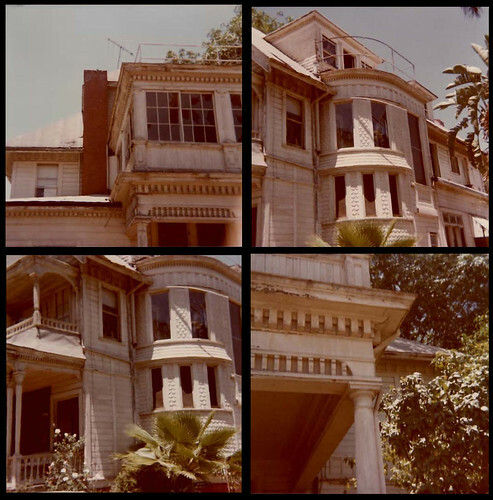 Now, in any other circumstance, the Center would’ve gone ahead and torn down the building, but the city had declared the mansion, its carriage barn, and formal gardens an L.A. landmark in 1978. To its credit, the church offered the building – for free – to anyone who would come and take it. 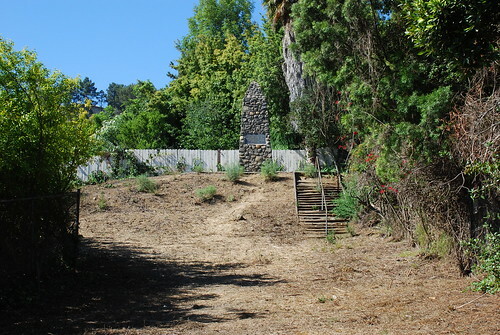 For a bit, it looked as though a podiatrist was going to move the monument to an eight-acre plot in Northridge for use as his home. That never happened, obviously. Too bad that while there were ultimately about 400 potential takers, the $600,000 cost, including the price of a new site, proved too prohibitive. A demo permit was issued in July 1986, and the razing began. I had considered driving down to the old campus, if only to get a picture of the 10,146-seat FaithDome, the ginormous geodesic dome occupying the site of the landmarked President’s House since 1989. In the end, though, I didn’t feel like it. I remember first seeing the dome from twentyish miles away on my regular weekend hikes to the Hollywood Sign when I first moved to L.A. (I also recall asking a friend what sports team played there). I’m not convinced I need to see it up close. Clearly, I couldn’t dig up a whole lot of pictures of the Pepperdine President’s House (the one at the post’s beginning is, as is often the case, from the L.A. Department of City Planning website). 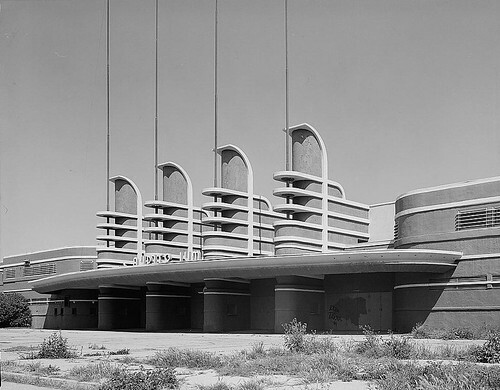 If anyone out there has any old photos of the landmark – inside or out – I sure would like to see them. I can’t imagine we’ll see a more dubious Historic-Cultural Monument in Los Angeles than this stack of 2,000 pallets out in Sherman Oaks. Actually, we won’t even see HCM No. 184 any more, either, as another unsightly apartment complex is currently being built on the site. Daniel Van Meter had a colorful past. His dad, James (d. 1938), was the chemist who invented the chloro-cyanic gas used in World War 1, to hilarious effect. Chums with Edison, Burbank, Marconi, Steinmetz, and Tesla and a protégé of Mexican President General Porfirio Diaz, the elder Van Meter introduced liquid chlorine to the U.S., concocting it at his Deutsche Chlorine Works in Germany. Daniel’s mom, Esther (d. 1954), was a great-granddaughter of John Quincy Adams. In April 1942, Daniel and two of his four brothers, James and Baron, surrendered to the man on charges of sedition under the Subversive Organizations Registration Act. 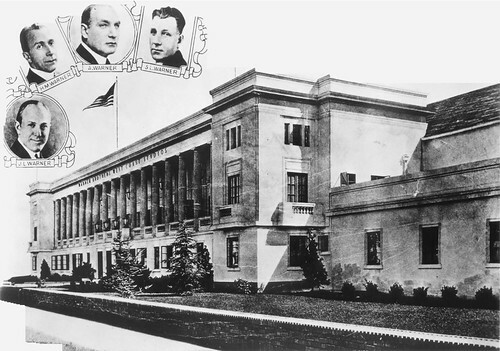 The trio, which was operating a goat, chicken, and rabbit ranch at 2180 West Adams Boulevard at the time, was busted for failing to register as members of Robert Noble and Ellis O. Jones’s “Friends of Progress”, a group that allegedly supported the overthrow of the U.S government while having ties to the pro-Nazi German American Bund. Baron (who became a well-renowned beer-can collector –Beer Can Collector of America #418! – and square dancing’s “Cacti Pete”, having the distinction of having attended every single National Square Dance Convention from 1951 to 2002!) and Daniel (who went on to co-found the American Independent Party in the 1960s) did time for their political beliefs, with the Dan landing in San Quentin. While a District Court of Appeals later reversed the conviction, the brothers’ demands in lost wages and damages were denied. In 1951, when union workers at a local Schlitz Brewing Company plant refused to repair thousands of junky 3'x3'x6" pallets, the enterprising Daniel Van Meter saw his chance and he took it. 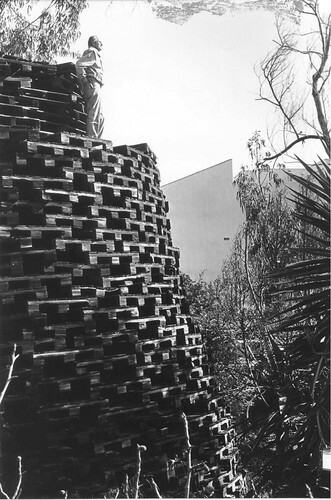 Using the five truckloads of discarded pallets, he began to build his monument in his backyard on Magnolia Boulevard off Sepulveda. 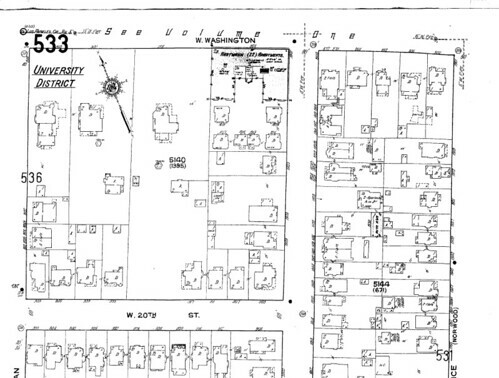 Van Meter had moved to the property in 1947. The land was once part of an apricot ranch owned by actress Louise Fazenda (you may remember her from such films as Schultz the Paperhanger, Tea: With a Kick!, and Are Waitresses Safe?). Going back to the 1800s, the land was owned by the McMasters family. The Van Meter boys (Baron moved there, too) ultimately turned their land into a veritable junkyard – later visitors mentioned seeing there a dozen scrapped cars, a gas pump, a 1938 city bus, washing machines and water heaters, an old outhouse, a battleship turret, and wooden wagons, not to mention the menagerie of cats, dogs, chickens, turtles, pigeons, and a raccoon. Daniel Van Meter died in June 2000 at the age of 87. Three years later, developers Westgate Group Inc. had in hand a demolition permit for the old Van Meter home. However, since the landmarked tower was protected, the developers had to get the city’s okay for its razing (or what was left of it – it had dwindled to about five-feet tall by 2002, according to Steve Harvey), which it did in early 2005. 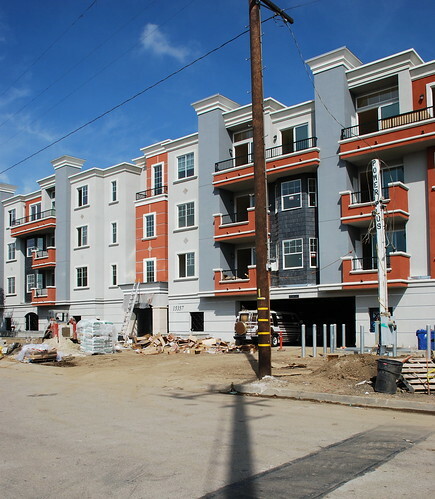 Today, construction on a new, 98-unit apartment building on the site of the Tower of Pallets (click on that link for a picture of Daniel and a chicken along with quotes to make you cringe) is almost finished (so, did they find the body of a 140-year-old three-year-old?). “… in a few years this piece of the good earth may be covered by apartments for the storing of surplus people. In the meantime, pray, let this strange structure be, let it continue to be a haven of rest for an individual – that endangered species – who once knew how sweet was our Valley. 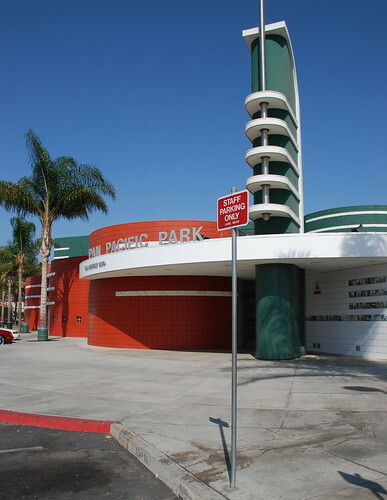 The architectural firm of Plummer, Wurdeman & Becket created the Pan-Pacific Auditorium as a temporary structure, initially serving the National Housing Exposition’s run for a few weeks during the summer of 1935. 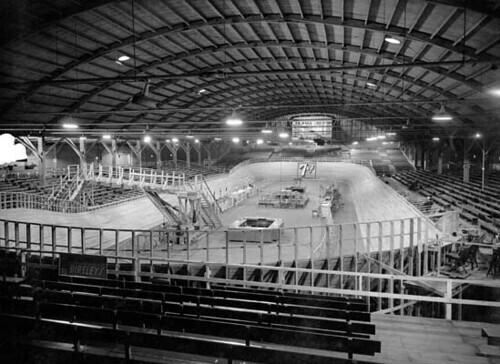 The big barn, however, went on to host all sorts of tradeshows, concerts, sporting events, circuses, horse shows, roller derbies, and political rallies, before being shuttered in 1972. 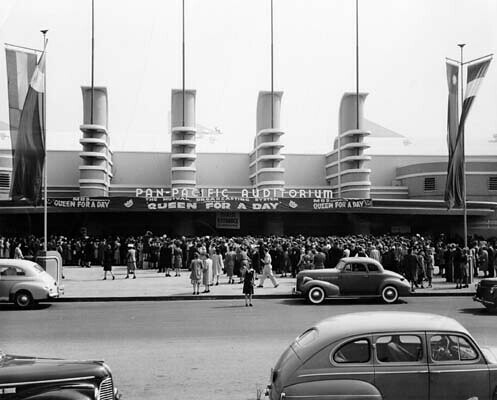 Built in just fifty-six days, the Pan-Pacific Auditorium opened May 18, 1935, as “the largest of its sort in the West and one of the three largest in the nation.” The 500-member Tenth Olympiad Chorus sang at the dedication ceremonies that Saturday night. If you were a kid in Los Angeles in the 1960s, there’s a good chance you saw the Harlem Globetrotters, the Ice Capades, or a circus or two here. 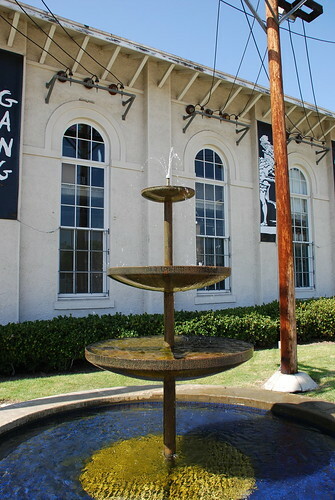 The Pan was also the site of Elvis Presley’s first west-coast concert. Q: How awesome would it have been to see Elvis with Scotty Moore, Bill Black, and D.J. Fontana and the Jordanaires perform here? A: Very awesome, indeed. And for $3.75 (cheap! ), too. Click here for thorough coverage of his October 1957 visit. A cafe in the auditorium. 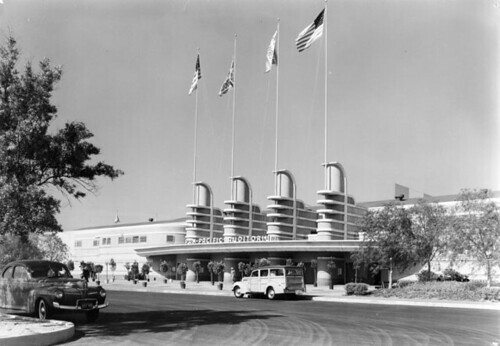 Along with the Grand Olympic and Shrine auditoriums, the Pan-Pacific became one of Southern California’s major indoor sports facilities. Besides supporting college and two pro hockey teams, the Pan saw its share of home UCLA basketball games. 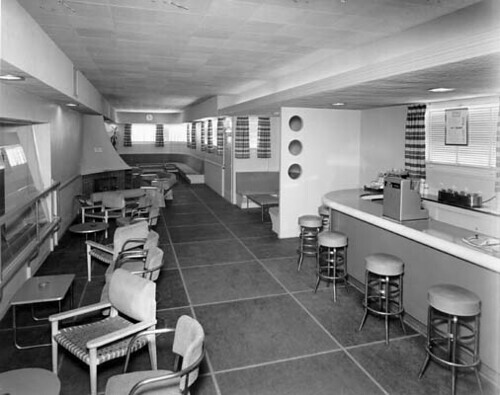 It was also the home court of the USC men’s basketball team from 1949 through 1959. 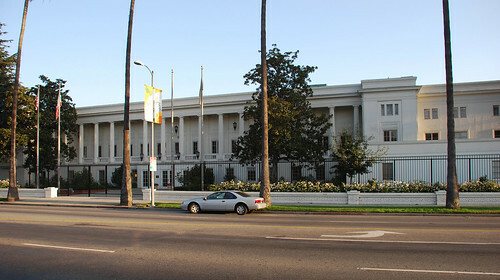 The Southern California Chapter of the American Institute of Architects gave the Pan-Pacific an Honor Award in January 1947. 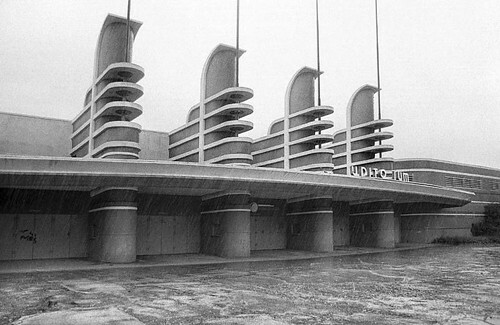 In 1959, the air-conditioned L.A. Memorial Sports Arena opened and the slow death knell began for the Pan. It continued on for another thirteen years, closing in 1972. 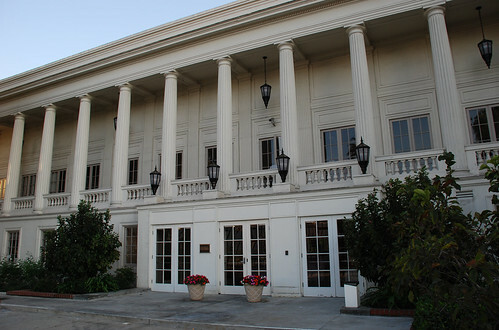 The county purchased the property in 1979, a year after it was both declared a city landmark and listed on the National Register of Historic Places, and a year before it made an appearance with Olivia Newton-John in Xanadu. In April 1988, the county of L.A. unveiled plans to incorporate the auditorium into a 116,700-square-foot retail and entertainment complex. Costing more than $14.5 million, the center would include a movie theater, food court, a couple of restaurants, an ice rink, gym facility, and office and retail space. However, a year later, on May 24, 1989, a little after 7:00 p.m., the dilapidated Pan-Pacific Auditorium burnt to the ground, the work of an arsonist. More than 200 firefighters battled the blaze, but the wooden structure went up fast, with the last of the four fin-shaped towers falling a little after 10:00 p.m. (see page 228 in McGrew and Julian’s Landmark of Los Angeles for a picture of the crumbled pylons.) Officials arrested a 42-year-old transient who, despite confessing to starting the fire, was released by the end of the month due to lack of evidence. The remains of the façade stood until May 1992 when they were cleared away for the new elements to Pan Pacific Park, the Pan Pacific Recreation Center (with its single-towered homage to the old landmark) and, later, Renee’s Place, a universal-access playground dedicated this past spring to Renee Weitzer, Chief of Staff and Planning Deputy in Council District 4. The park falls under the jurisdiction of the city’s Recreation and Parks Department. Today's Pan Pacific Recreation Center. The black and white shots here, except for the top one, are from the Los Angeles Public Library. That first one is from the Library of Congress. For a trio of color shots of the Pan in 1980, click here to see Larry Gassan’s Flickr photographs. 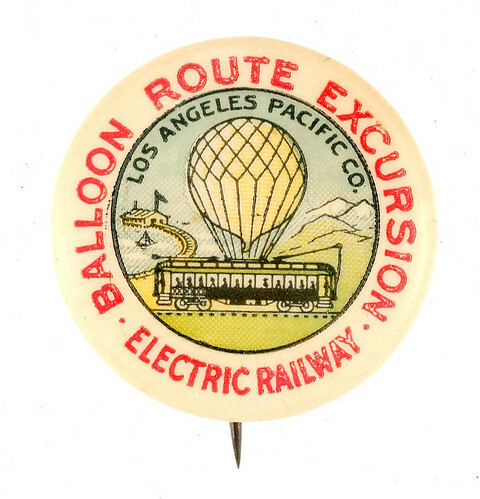 The Electric Railway Historical Association of Southern California tells us the Balloon Route “was the most famous trolley trip in the west.” In an old interview, Mr. C.M. 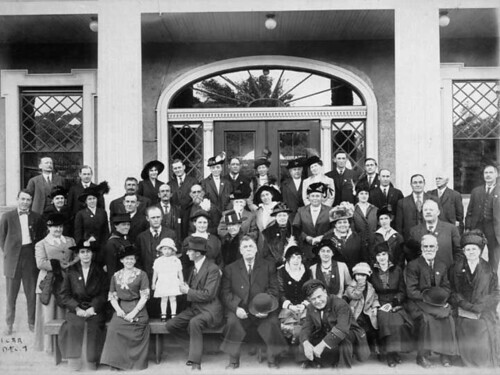 Pierce, former owner of the Glen-Holly Hotel at Yucca and Ivar Streets in Hollywood, said he took over managing the under-promoted Balloon Route Trolley Trip on Thanksgiving Eve in 1904. Pierce, through “advertising bombardments”, grew the route’s excursions from just one car to as many as eighteen carloads a day. It was parlor car No. 400, formerly General Moses H. Sherman’s private car, which led the excursions for years and which Pierce had rented for $15.00 a day. The route covered more than 101 miles for the cost of one hundred cents (i.e. a dollar). All told, the Balloon Route excursion visited ten beaches and eight cities during its seven and a half hour trip. The railway called it the Balloon Route because the line’s loop was shaped like a big balloon, even though it clearly wasn’t, as evidenced in the map below. 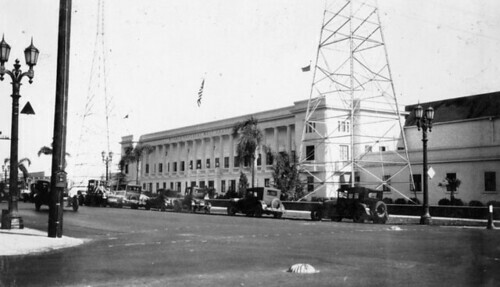 The trolley, complete with a white-capped guide, would take off out of the Hill Street Station downtown (originally out of the Fourth Street Station), passing “the main hotels, railroad offices, Court House, the old Spanish Plaza and Chinatown, the battle-ground of Generals Fremont and Pico, through the oil district and past the Sisters’ Hospital on Sunset Boulevard, and along the foothills to the famous Cahuenga Valley and that modern “Garden of Eden” – beautiful Hollywood”. Here, the trolley would stop at Hollywood’s first tourist attraction, the home of painter Paul de Longpre at the northwest corner of Hollywood and Cahuenga. Across the street from the house was a freight station where the cars would stand by while passengers would visit de Longpre. 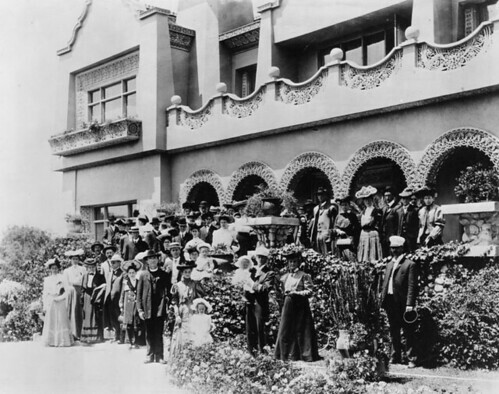 Here’s a picture of Balloon Route tourists posing in front of the house (demolished in 1925). 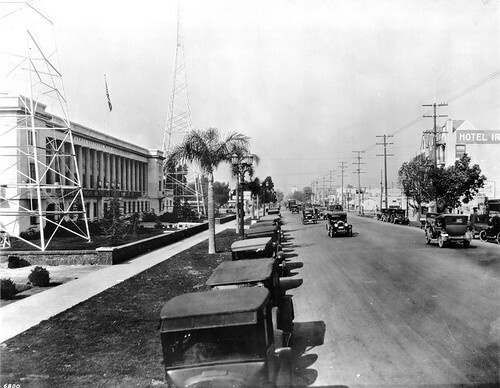 The trolley traveled through Sherman (West Hollywood) and on to Sawtelle’s National Soldiers’ Home where the passengers would have another group photo taken (the photographer would race back to his lab, develop his film, and sell the photos to the tourists later that same day). After that, it was coastward through Westgate and Brentwood Park (“modeled after Golden Gate Park, San Francisco”) to Santa Monica and its Camera Obscura and Long Wharf. The trolley also visited Ocean Park for a ride on the roller coaster and Playa del Rey for a fish lunch. Passengers would check out “Venice of America” and Redondo’s pier and Moonstone Beach, too. The trip ended by taking the Air Line Route back to Palms where they’d watch some silent movies before heading back downtown. 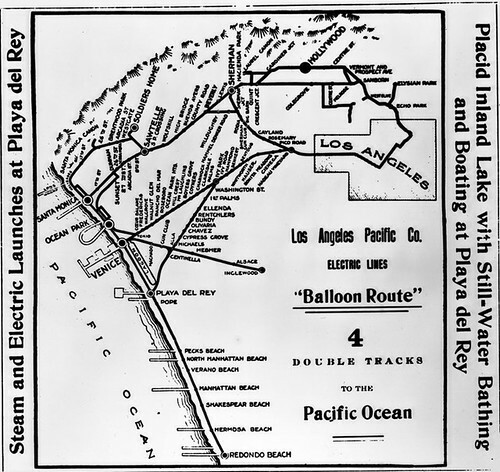 Pierce operated dozens of Balloon Route trips from San Francisco to San Diego. 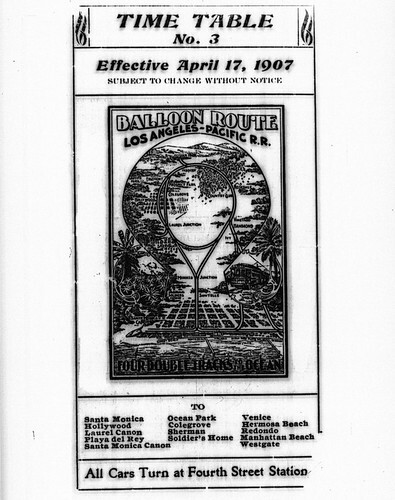 After the “Big Merger” with the Pacific Electric in 1911, he went on to become the company’s Manager of Excursions, adding the Orange Empire, Old Mission, and Triangle Trolley Trips to his responsibilities. 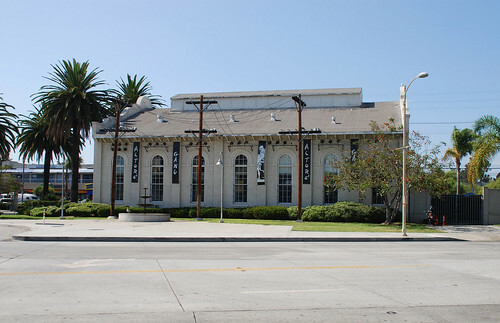 In 1982, when the city of L.A., which had bought the building five years earlier, advertised it wanted commercial and nonprofit groups to submit bids to purchase or lease the substation, Culver City jumped in the following year and offered to lease the building and turn it over to a nonprofit organization. 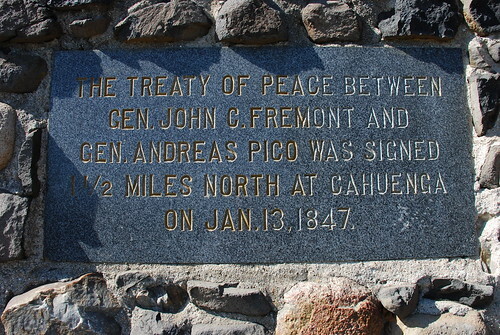 The two cities eventually did agree to a forty-year lease, but, with typical governmental swiftness, that wasn’t until 1987. 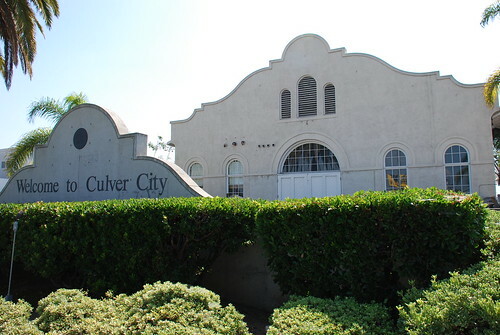 Part of the deal called for Culver City to spend $1 million not only to renovate the building's interior, leaving its brick shell intact, but also to upgrade the adjacent two-acre Media Park, which Culver City had been trying to get its hands on since 1963. A $1.9 million rehabilitation project on the substation and park began in 1991. 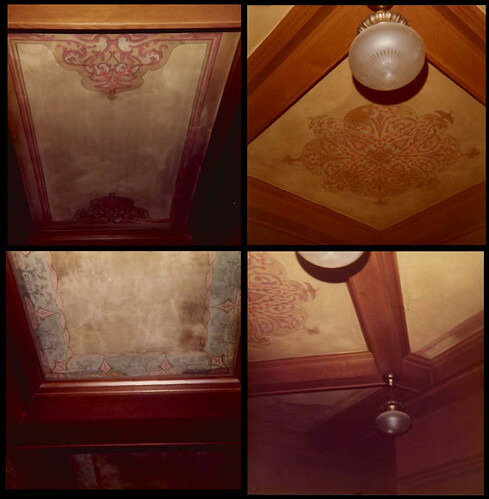 Milford Wayne Donaldson handled the renovation’s design and construction plans while the contractor was the Driver-Eddy Construction Company. 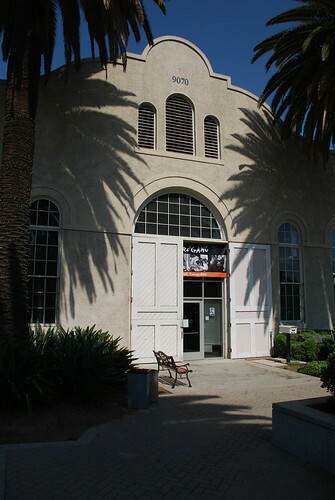 The substation re-opened as a community center in April 1993, boasting a 3,500 square-foot main room. 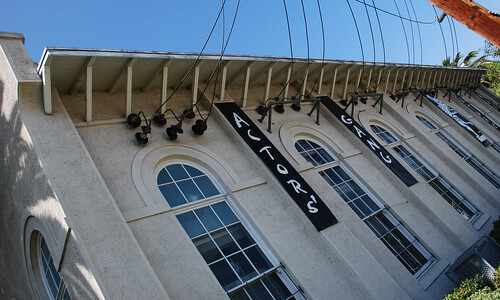 Steven Ehrlich Architects and Matt Construction converted the old substation into a 99-seat theater in the fall of 2002. The resident company is Tim Robbins’s The Actors’ Gang. 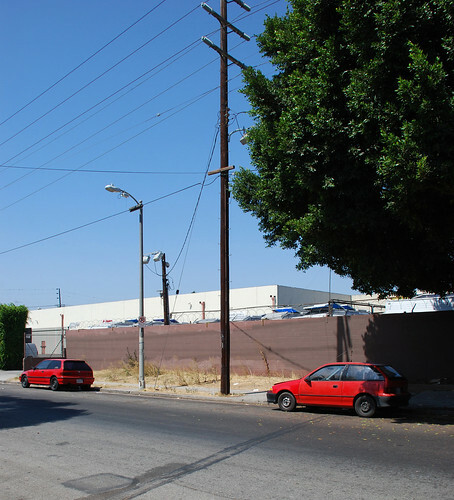 Maintenance and operation of the substation and park fall to the Culver City Redevelopment Agency. 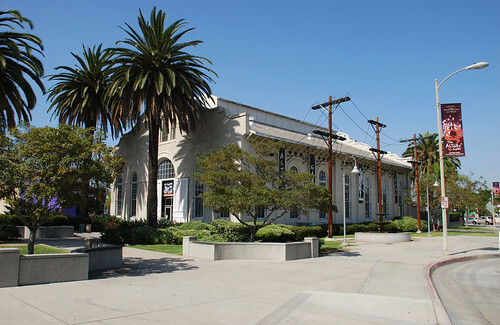 The last major remaining structure built by the Los Angeles Pacific Railway Company, the Ivy Substation is also listed on the National Register of Historic Places. 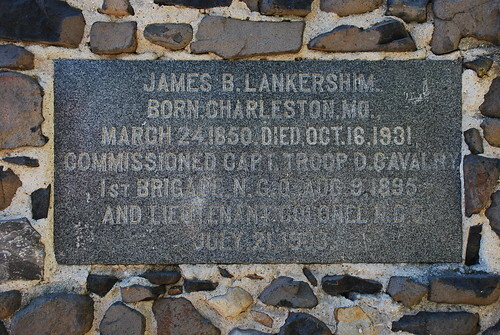 James Boon Lankershim was born on a Charleston farm near St Louis, Missouri, on March 24, 1850, the son of Isaac Lankershim and Annis Lydia (Moore) Lankershim. Isaac, a native of Bavaria, was a pretty big L.A. muckety-muck in his own right, becoming the principal owner of 60,000 acres of the former Mission San Fernando in 1869, and, nine years later, cranking up the city’s first flour mill. The Lankershims moved to San Francisco when James was a boy. At seventeen, he began working for his dad’s grain business there. A year later, J.B. became manager of the 13,000-acre Lankershim ranch in Fresno County, then the manager of the family’s 40,000-acre El Cajon Ranch in San Diego. 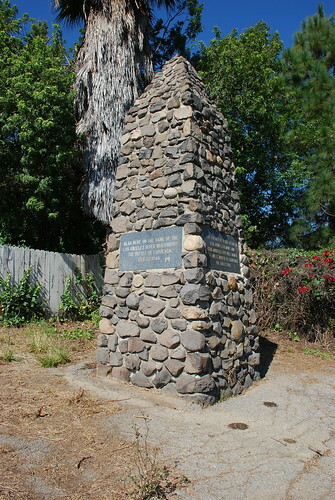 The young Lankershim settled in L.A. in 1873, becoming general manager of the 60,000-acre San Fernando ranch. James began stocking the land with horses, cattle, more sheep, and mules. Then he began experimenting with wheat (I did, a little, in college). Within a few years, Lankershim had a wheat field of a continuous 20,000 acres. He had also developed several thousand acres of orchards. He married Caroline Jones in 1881. They had two children, John and Doria Constance. In 1886, Lankershim was elected president of the Main Street Savings Bank of Los Angeles, a position he held for fourteen years (he was also president of the Bank of Southern California for two years). James Boon “at one time owned every corner which had a value as business property in the business center of Los Angeles.” He organized the Los Angeles Farming and Milling Company in 1887. While the new company purchased from him the bulk of the 60,000-acre ranch, he kept about 12,000 acres for subdivision. This land would go on to be the communities of Studio City, Universal City, and North Hollywood (itself called Lankershim until 1927). Lankershim also played a big part in lobbying Congress for $3 million for the improvement of San Pedro Harbor. He organized a cavalry unit of the state’s National Guard in 1885 and the L.A. Cavalry Troop in 1897. 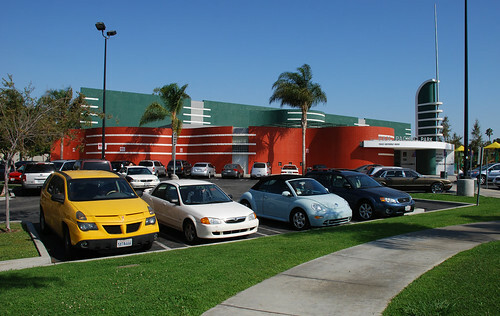 Lankershim built the San Fernando Building (HCM No. 728) and his eponymous hotel and building. In 1900, Governor Henry Gage appointed Lankershim a lieutenant-colonel, assigning him to his personal staff. Mayor Meredith Snyder also made him Park Commissioner. J.B. was a Knight Templar, a Shriner, and a 32nd Degree Mason. He was one of the charter members and first president of the L.A. 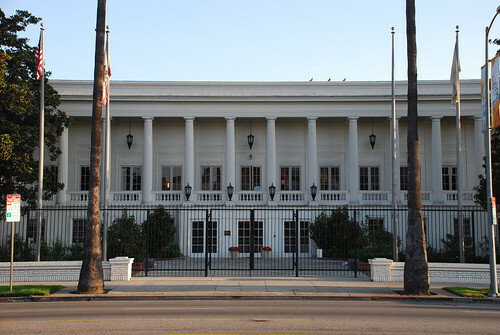 Athletic Club, and was affiliated with the Gamut, Ellis, California, Jonathan, Union League, Hollywood Athletic, and San Gabriel Athletic clubs. James Boon Lankershim retired in 1900 and died in Brooklyn, N.Y., on October 16, 1931, with an estate valued at $8.1 million. Well, J.B. Lankershim donated somewhere between ten and nineteen acres of land at the end of Nichols Canyon Road, down from Mulholland Drive, to the Boy Scouts of America. (Once known as Camp Arthur Letts, it bordered the home of Errol Flynn.) In exchange, the Boy Scouts built in the early 1940s his requested fifteen-foot tall monument among his scattered ashes. 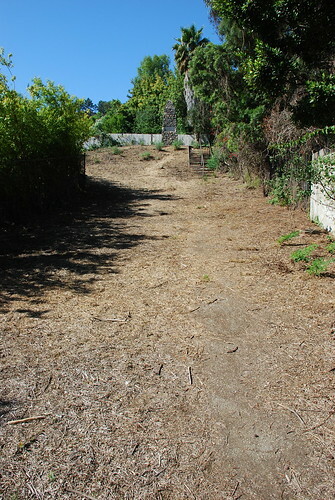 The Scouts sold off most off the acreage in the 1950s, but kept the strip of land holding the monument and, for lack of a better word, stairs. 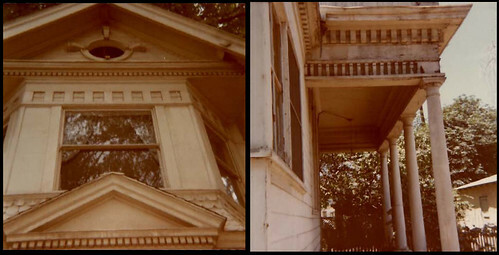 It’s been apparent for decades the upkeep on the city landmark has been lacking. 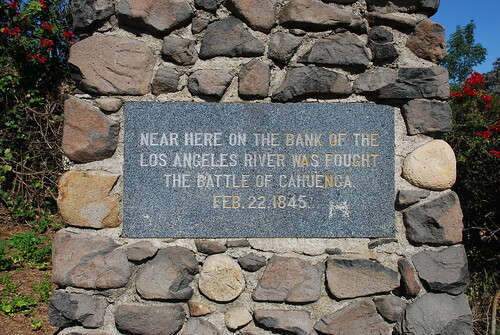 There’s been talk over the years to relocate the monument, possibly to Campo de Cahuenga. As recently as last year, it was determined, due to construction and its location up the steep hill, moving it as a whole is pretty much out of the question. In any event, it’s lonely. Go and visit it. 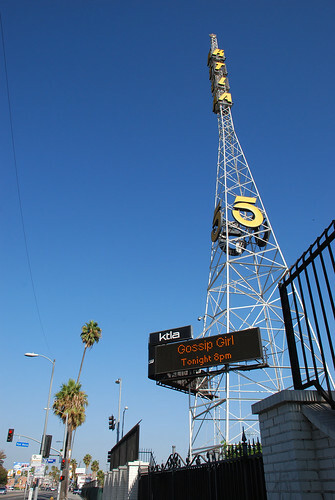 So the next time you’ve got folks in from out of town, drive by 5800 Sunset Boulevard and say, “This used to be Warner Bros back in the twenties. It’s where they filmed The Jazz Singer, the first feature with synchronized sound.” If you stop right there, they’ll be quite impressed. However, if you continue to show off with, “It’s also where they filmed Don Juan, the first feature film with a recorded musical accompaniment (via the Vitaphone process), and Lights of New York, the first all-talking feature,” your friends will roll their eyes and call you a nerd. Trust me on this one. 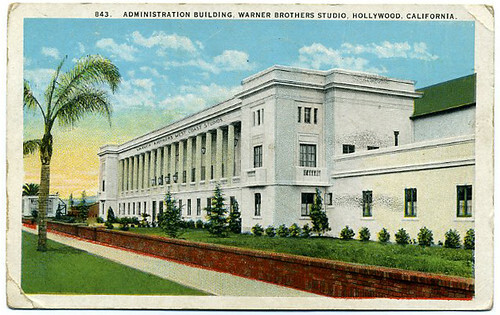 The Brothers Warner – Harry, Albert, Sam, and Jack – had been making movies in their downtown Los Angeles studio at 18th and Main when they bought ten acres of Hollywood land off Sunset and Bronson from the Beesmyer family. The cost? $25,000 at $1,000 per month, no money down. 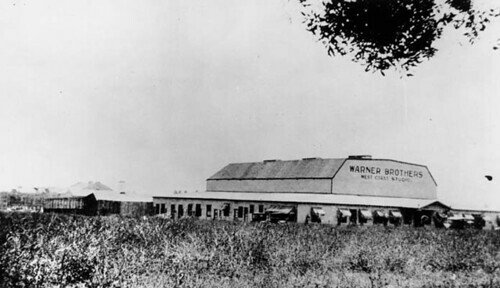 The Warners tore down the barn in 1923 and built a collection of smaller stages and buildings in its place. 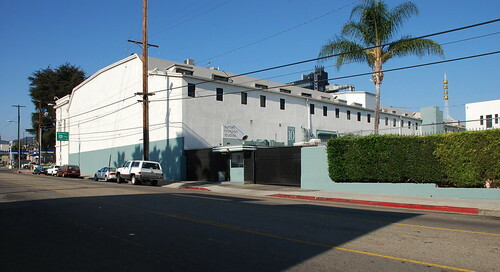 In addition to The Jazz Singer, Don Juan, and Lights of New York, other movies filmed at the Hollywood property included Mammy, Svengali, and The Public Enemy. The biggest movie stars to emerge from Sunset and Bronson were John Barrymore and Rin Tin Tin. 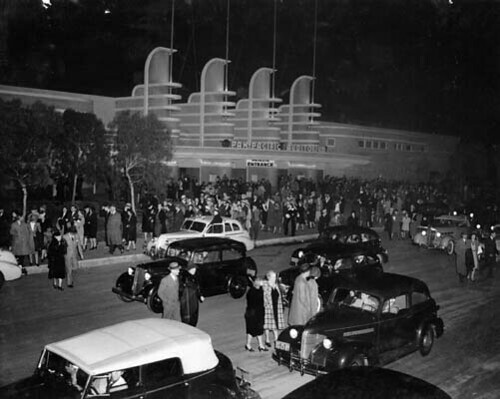 By the end of 1937, the Warner Bros had vacated their Hollywood home. 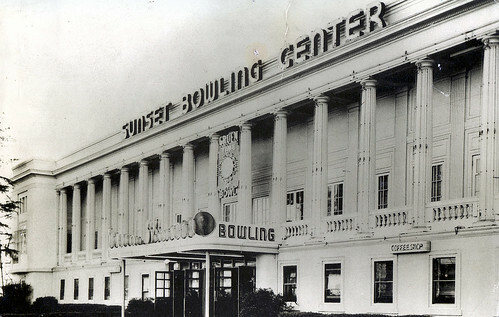 A Warner brother-in-law, Rose Warner’s husband, Harry Charnas, however, stuck around, opening a 52-lane bowling alley behind the old executive offices. 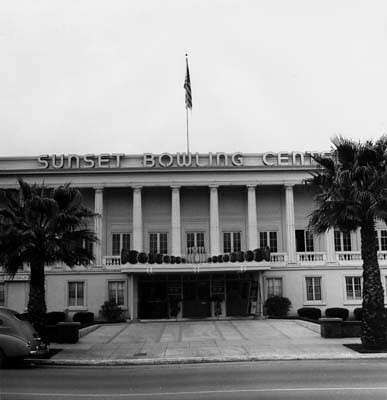 The Sunset Bowling Center was part of a “sports palace” that also contained badminton courts and a skating rink. 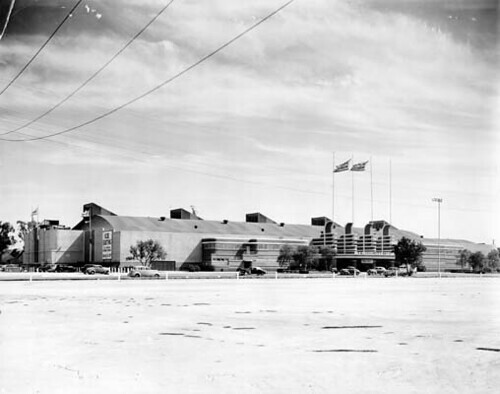 Paramount bought the site in 1954 to provide television production facilities for KTLA, the first commercial TV station west of Chicago. The following year, the KTLA's general manager and the man who oversaw it’s start as experimental station W6XYZ back in 1941, Klaus Landsberg, announced some of the lot’s older buildings were being demolished to make way for the new facilities (it became the home of Matt Dillon and Gunsmoke). 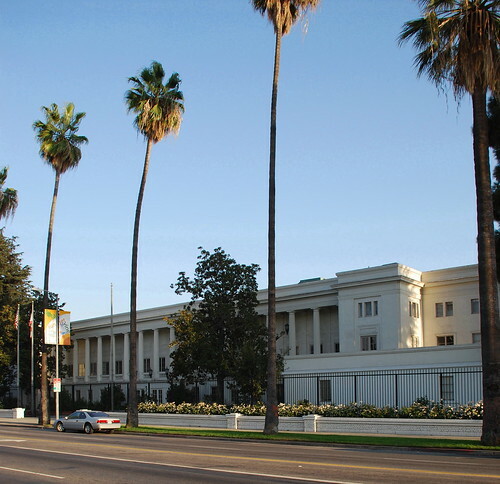 Paramount was also telling folks they were going to spend a million dollars on converting the old executive building into the new Motion Picture Exposition Building with proceeds to go to the Motion Picture Relief Fund. It was to house “a movie hall of fame, representing film favorites through the years, and display motion picture-making equipment, sets, wardrobes, live demonstrations and reproductions of set activity.” I reckon they got sidetracked. 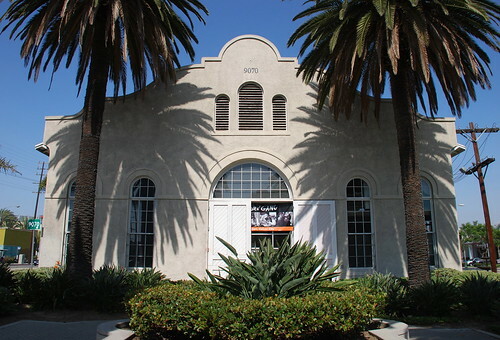 In 1977, in conjunction with The Jazz Singer’s fiftieth anniversary, the city of L.A. declared the old Warner Brothers West Coast Studio Historic-Cultural Monument No. 180. At the time, the lot was filming Sha Na Na, What’s Happening, Carter Country, Sanford Arms, The Donny and Marie Show, Fernwood U.S.A., The Newlywed Game, The Liars’ Club, Hollywood Connection, and something called SZYSZNYK, starring Reggie Jackson, Debra Winger, and Ned Beatty. Immediately behind the administration building. The investment banking firm of Kohlberg, Kravis, Roberts, and Company bought the lot and KTLA from GWB in 1982. They turned around and sold out to the Tribune Company just three years later. 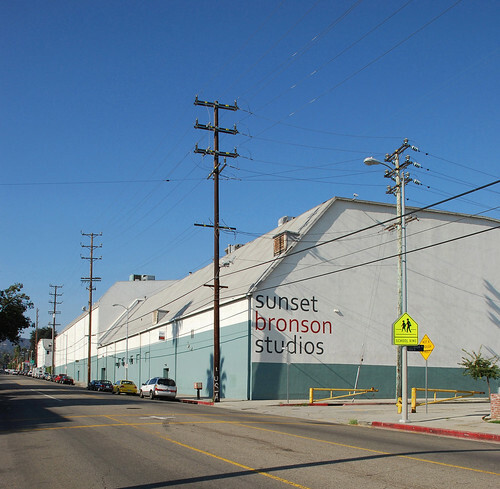 In January of this year, Hudson Capital, which just paid $200 million for Sunset Gower Studios last August, bought the landmark 1920s Warner Bros Studio for $130 million. I asked Marc Wanamaker, president of Hollywood Heritage and co-author of Early Hollywood, just what remains of the lot’s old Warner Bros days. 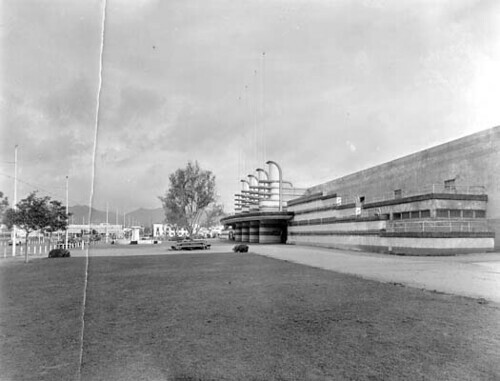 He says there are many original buildings: the administration building; the original stages #1 and #2 (now stages #9A and #9B behind administration building – this double stage under one roof later became the bowling alley); the stages fronting Bronson Avenue (now stages 1, 2, 3, 4, 5); the rear block-long building (the old Termite Terrace and now the site of KTLA); the prop/special effects building (now production offices building #2); as well as the stage where some of the sound engineering for Don Juan and The Jazz Singer was filmed (it was one of the KTLA sound stages, located adjacent to the KTLA building toward the rear (south) part of the lot). Unfortunately, Marc adds some of these buildings are slated for demolition shortly. This may include the last mentioned, the most historic structure. Marc also told me the current KTLA tower was one of the two KFWB towers that once stood in front of the administration building. Sometime in the late 1950s the west tower was removed and the east tower moved to the corner of Van Ness and Sunset. Finally, here’s yet another picture of the old administration building, of classical design with that big colonnade of Doric columns. It saw expansions in 1929, the 1940s, and in 1965 (at least). Sad to say, but Los Angeles Landmark No. 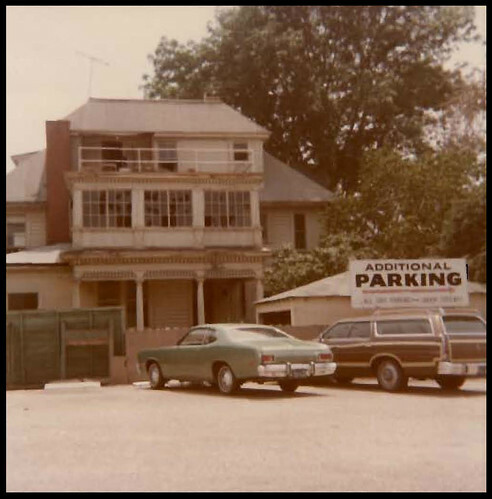 179 was demolished more than thirty years ago following a substantial fire on May 23, 1978. If it weren’t for these old photos, courtesy of the city’s Office of Historic Resources, we may have no evidence at all of this nearly-forgotten monument. Ten years later, to make room for the Hartman Apartments, the house was picked up and moved around the block to 919 West 20th Street. Special extra-big thank to Rita at the Office of Human Resources who provided me with these scans.